Is there a better alternative to Speed Reading III? 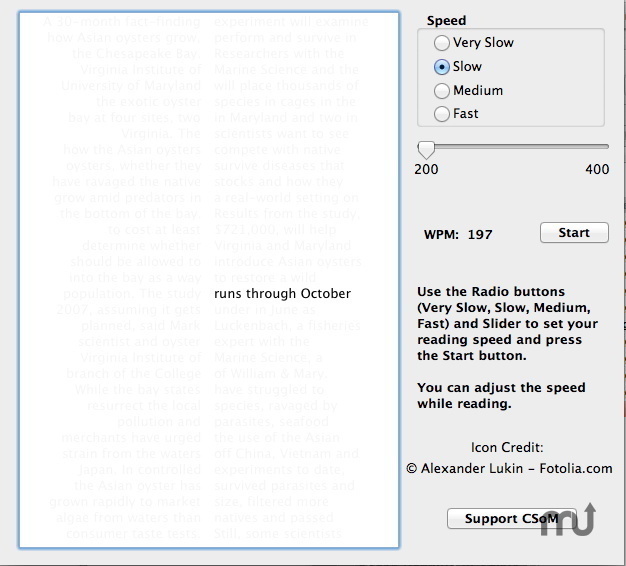 Is Speed Reading III really the best app in Teaching Tools category? Will Speed Reading III work good on macOS 10.13.4? Speed Reading helps you improve your reading speed. The average reader reads at about 200 words per minute (wpm) with a typical comprehension of 60%. The top 1% of readers do much better, reading at more than 1000 wpm with a comprehension of 85%. Such high-speed reading requires serious concentration. Speed Reading III needs a rating. Be the first to rate this app and get the discussion started! This application lets you try reading by looking at two midpoints on each line and continuing to move forward without going back and re-reading. Ten text sources are included. You can adjust the speed of the moving window from approximately 200 wpm to 1500 wpm in three ranges (slow, medium, and fast). A slider is provided to adjust the speed within each range. This utility was written in REALbasic and is freeware.